The State Department issued a travel warning Monday to alert U.S. citizens in or traveling to Iran of the danger of their capture. The warning comes after Iran has made detaining Americans a priority following the controversial news that the U.S. gave $400 million to the Islamic Republic on the same day they released U.S. military prisoners. The statement comes just after the latest controversy that the U.S. detainees were held on the ground until an airplane holding $400 million dollars in cash that was allegedly sent to resolve an outstanding financial dispute touched down in Iran. Though the Obama Administration has repeatedly denied the payment was “ransom”, they admitted the delivery of the cash was contingent with the release of the prisoners. State Department Spokesman John Kirby first said the exchange wasn’t “ransom” but “leverage” during a State Department press briefing and continues to defend that statement. While the Obama Administration continues to deny that Iran holding detainees until hundreds of millions of dollars in cash was handed over was ransom, there is no doubt that the facts together seem allude to the fact it was a form of ransom. 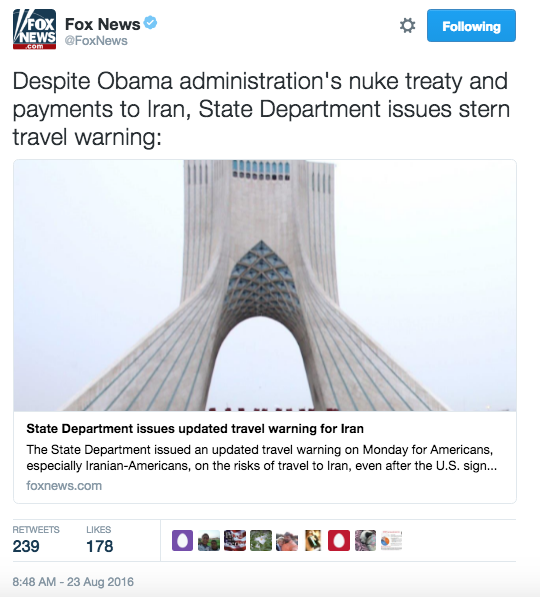 While U.S. citizens who are critical of the Administrations lack of transparency believe that to be the case, the latest travel advisory warning Americans of their possible capture if they travel to Iran would lead some to think Iranian officials believe the payment was a form of ransom as well. EU President Rips Nationalism, Says National Borders Are "The Worst Invention Ever"